Place all marinade ingredients in a small bowl, mix to combine. Rinse the swordfish steaks in cold water and pat dry. (Don’t remove the fish skin, it will help keep the steaks from falling apart when grilling. You can always remove after the fish is cooked before serving, if you want.) Place the fish in a non-reactive dish and cover with the marinade. Coat on all sides with the marinade. Cover and refrigerate for a half hour to an hour. Prepare your grill for high direct heat. You know the grill is hot enough when you place your hand one inch above the grill grates and you can only keep it there for 1 second. Wipe the grill grates with a paper towel infused with olive oil to oil the grates so the swordfish steaks don’t stick when you turn them over. Brush off excess marinade (not all of it, just most) from the swordfish steaks. 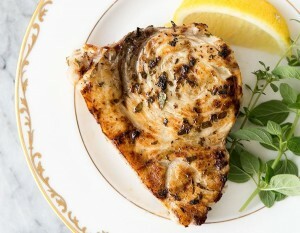 Place the swordfish steaks on the hot grill grates. Grill for about 5 to 7 minutes on one side, until you have good grill marks. Turn over and cook for a few minutes longer, until the fish is just cooked through. Remove from heat and let rest a few minutes before serving.